For the first few years I moved away to the US, my family would always ask me to bake brownies when I’d come back to visit. There is a little of an unspoken love affair for that simple square of dark chocolate, sometimes studded with nuts, sometimes often adorned with a scoop of ice cream. Almost always with a short cup of espresso. I can’t even recall where I found my first recipe for brownies and I admit I go through what B. dubbed my “brownie baking frenzy phases”. I have been known to bake quite a few batches in the span of a few days just to keep finding the elusive “perfect” one. I know I am not the only one with that problem. However, there is one I have favored a bit more over the years, probably because I memorized it easily and it has never failed so far to produce the same deep dark squares of chocolate brownies, smooth and rich as velvet. The thing is, I am pretty sure I have never baked this one for my family here. I’m hoping to have enough time to do so and leave a batch on the kitchen countertop before I head back home to the US. When Caitlin and her fiancé came to visit this past month so I could shoot their engagement session, I had just worked on a savory food feature and the fridge was fairly void of anything sweet. One evening that we had planned to grill and just chill on the patio, I figured Caitlin and I could tackle a batch of brownies as we went about the kitchen getting dinner together. Who better than an “engineer baker” to share the kitchen with? Well, all my blogging friends actually but the dogs would go insane from excitement!! As we were baking, I threw in the idea of vanilla ice cream and caramel sauce. Salted butter caramel sauce to be exact. All of sudden I had 3 pairs of eyes staring at me with such intensity that I knew I could not get around that one and take my words back. You cannot take back “salted butter caramel sauce”...Period. Before I left for France I made B. a double batch and tucked one in the freezer labeled "in case of an emergency - ice cream to your right". After only one week away, he said that batch is about gone. His schedule has been a frenzy of work and rehearsals for Hairspray (he plays trombone) afterwards and he has had no energy to cook afterwards. We are traveling in the Alps and Provence as you read this (the magic of scheduled posting) and I sure hope I don't get a text "come home now - brownies all gone!"...ehehe! Vanilla ice cream worked perfectly with the brownies but I got to tell you that the ginger ice cream I made a couple of days after that weekend was so much better. It highlighted the intensity of the chocolate and contrasted with the sweet/salty caramel in such a way that it took us great self control not to polish a couple of more servings. I made the same batch of brownies, ginger ice cream and salted butter caramel sauce three times that week. And if you find yourself with extra of either or and nothing to go with it, just a spoon will do. Trust me. Mmmmmmmm. My mouth is watering. My husband doesn't like ginger. However, I bet the chocolate and carmel compliment the ginger very nicely. I'm sure this is one ginger treat he would eat! Oh my this is fantastic, gotta try it out today - we got guest´s al the way from Rome visiting. Yumm, these look just beyond amazing!! Wow. Wow. That sounds amazing. What a fantastic dessert! That combination is really mouthwatering and the presentation is gorgeous! Holy Yum! I so wish I could cook!!!!! I am demanding that my sister Cami make these for me this weekend. (she has culinary talents) Oh to be so lucky! 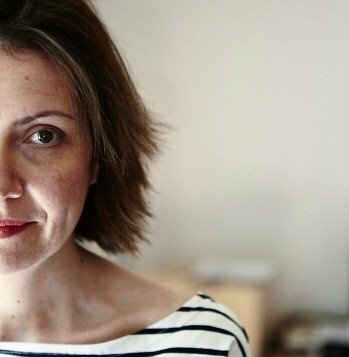 I heart your blog so much. LOL I just saw my sister already posted a comment. oh well, I too will comment. mmm brownie and caramel sauce... love it! Ah how delicious! That caramel sauce looks incredible. 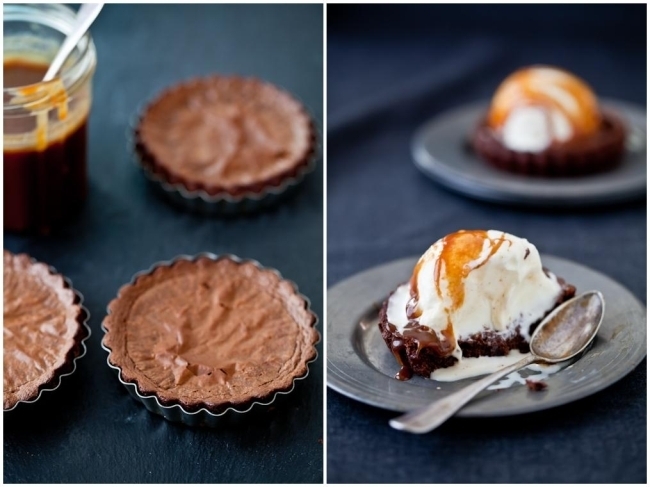 chocolate + ginger + salted caramel = probably the best combination ever! those brownie sundaes are seriously calling my name! How absolutely divine! Desperate for choccie now...and caramel! It's so funny, I was just about to suggest Martha's brownies. The one's from her baking book are amazing, but then I saw the title lol. Ginger ice cream sound great by the way. this is maybe a silly question, but would they come out right replacing rice and other flours by all purpose flour? 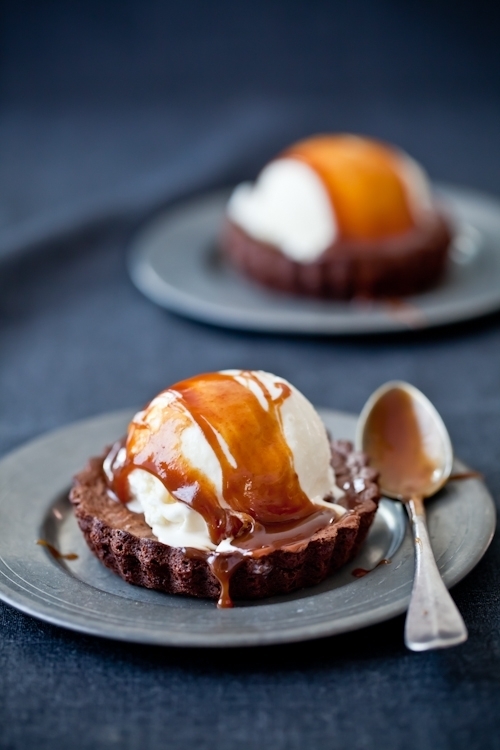 oh it's bad enough you post a brownie recipe but there is absolutely no way I am going to be able to get past that salted caramel sauce - that might just be my absolute most favorite thing in the world. Thanks for posting! This looks incredible! What a dessert! I can't get over how decadent and perfect these look! 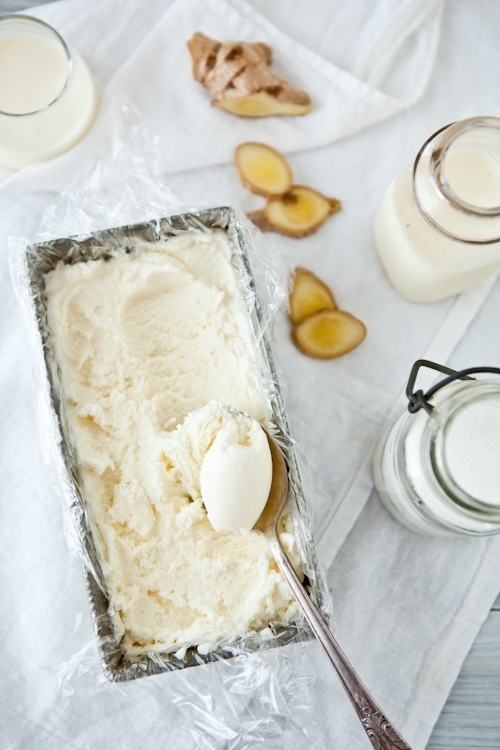 Ginger ice cream just sounds out of this world - beautiful photos!! They look delicious! I will try them this weekend. How long do I bake in tart molds? In your beautiful pictures you made the brownies in little individual tart pans. How long and at what temperature did you bake them for? Your recipes lists a different pan. I have the same mini tart pans and would love to try this. Thanks! It's like all of my favourite things combined into one! I never tire of brownies and yes, I am always in search of the 'perfect' one. That is my favorite dessert ever. Warm brownie, ice cream and fudge. I'll have to try the Carmel sauce however, I'm sure it is fabulous. I find myself more and more inclined towards ginger ice-cream than plain old vanilla ones. Somehow its spicyness works to temper the richness of chocolate, meaning that I can have more spoonfuls without feeling over-satiated! :) Lovely pics as usual, and now you've got me curious about trying *another* brownie recipe. Gosh, these look fantastic! Beautiful photos, too. Out of curiosity, have you ever tried the recipe on the back of Ghirardelli cocoa powder? It's the butteriest brownie on the planet. Ca l'air vraiment délicieux! Le support de brownie avec la glace parfumée, je fond! Chocolate and caramel are a match made in heaven, Helen - and adding ginger is making me drool here! Love it! SilBsAs: having tried them both ways, I can say they come out exactly the same. natalia: they are lactose free butters at the stores but I can't vouch for any of them unfortunately. Baking time for smaller molds is listed in the recipe intructions. Good Lord, woman - I will be daydreaming about these beauties today. I hope you are having a wonderful visit with your family. The brownies look amazing (and super cute baked in those little tart pans!) I just finished eating my last batch of homemade ice cream and this ginger ice cream is calling my name! I need these in my life! The engagement photos you took of Caitlin are beyond stunning! I hope you are enjoying your time in France with your family. 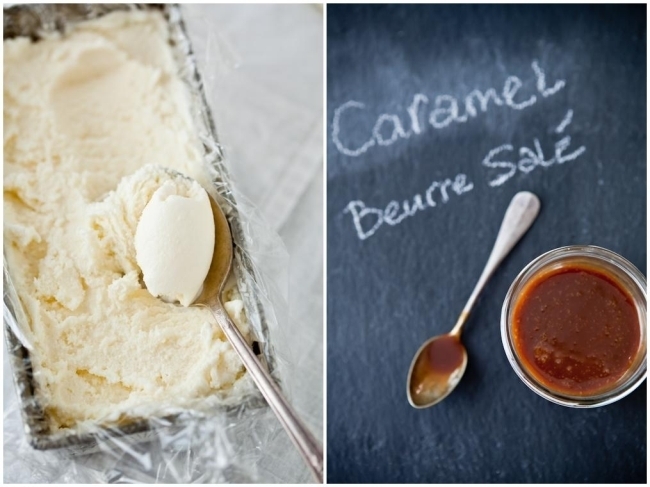 Caramel au beurre salé with ice cream is something I love, so I am sure it will be fantastic with brownies too! Just the name makes my mouth water and your photos take it over the top. I have posted before, I am not a baker, except for cookies at Christmas. I have a separate file for ginger cookies. I think this post is going to stick in my mind for quite some time. I am seriously drooling. I think this includes most everything that makes my mouth water. Love the hint of ginger! Actually, I can't stop staring at the last picture, as it is really amazingly delicious and gorgeous. I can perfectly figure out how the ginger ice cream can work with brownies and salted butter caramel, classy but fresh and young! Beautiful as always! 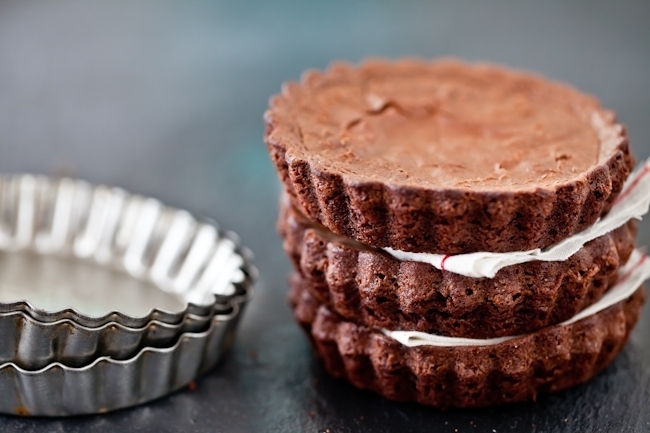 Baking the brownies in tartelette tins is a lovely idea! Natalia, pure butter has very little lactose and chocolate over 70% usually has none either. The post looks so yummy, I love ginger. I have been trying to decide what to bake for Fathers Day which is tomorrow here in Australia. 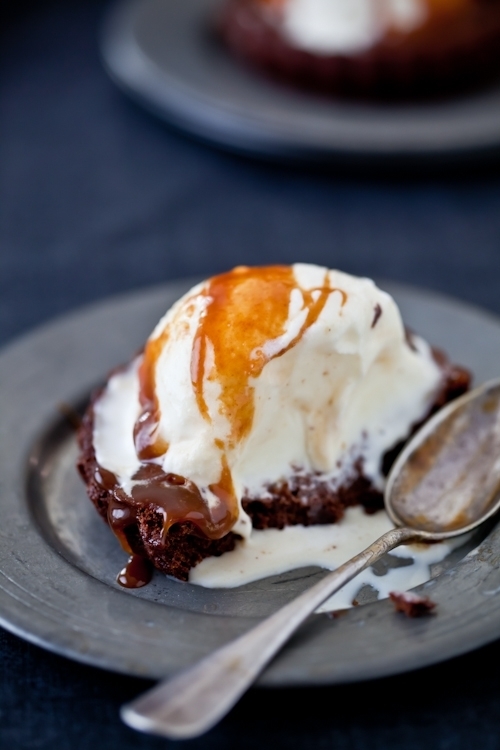 Thanks for the inspiration - Dark chocolate brownies, ginger ice cream and salted butter caramel sauce it is!!! I've been having a bit of a tussle with pastry this last week, and made what I've now called fugly tartelettes! ;) But now I will use this brilliant idea of a brownie base and ice-cream!! Looks amaaaazing! gah! I nearly burst into tears when I saw this. Maybe I'm a little hormonal, I don't know. but chocolate, this chocolate with ginger ice cream and salted caramel ins particular, is surely the cure for whatever it is that's wrong with me. Oh gosh I love this, just love this! Ginger ice cream is a favourite here. Salted Butter Caramel Sauce! Wow, I quickly browsed for the recipe. It looks so yummy, can't wait to make this. It looks amaaaaazing, so gooey.....I'm definitely going to try this recipe....thanks for sharing it !!!! WOW, that looks amazing! I love when the ice-cream slightly melts, it just makes it taste even better! Ohhh Wow!! just starred this recipe! It is the next one of my list! congratulations! you just made me sigh & close my eyes at the same time! these look incredibly delicious & beautifully photographed. Oh my, what a wonderful trio! Oh this looks just divine! I'm one of those unusual people who don't go crazy over brownies, but my eyes went wide over the this recipe. From the Kahlua in the brownie batter, the ginger in the ice cream, and the caramel? Sounds like heaven! Hi Helen! first time posting a comment but this post deserves some feedback. Yesterday, I made two batches of the ginger ice cream for a pool party and it was a HUGE hit. It is absolutely delicious and oh so aromatic.. loved it! Thank you for sharing! Hm ... would 3/4 cup all purpose flour be the right substitute for the rice flour, cornstarch, and millet? Also my first time posting a comment; I made the brownies yesterday as well as the caramel sauce. The brownies were delicious and I even had the little tart pans to bake them in; it made them look so much more special. I also made the caramel sauce and it looked great until we ate it. The second it touched the ice cream it turned to rock. I left a spoon in the jar and when the sauce cooled, I couldn't take the spoon out of the jar. I think the recipe says to cook for 20 or 25 minutes, but I turned it off after 15 as it was very thick by then. What did I do wrong? The taste was great though. . .
Eva: no idea. I never had this happened but I'll sure give it some thought when I return. Thanks! mkd: yes, I added a note about it after your comment. Thanks! What a gorgeous combination! Love the photos as well! Yummo have to give this recipe a go! looks so yummy, brownies, ice cream, caramel, just brilliant combo! Yummy! I'm going to try to make it but with a vanilla ice-cream (i'm not a big fan of ginger). You're right, there really is no going back from salted butter caramel sauce. It looks absolutely wonderful!! I think this is the best brownie presentation I have every seen. I love the idea of baking them in tart cases - it's perfect! No - you cannot take back "salted butter carmel sauce" - and now I can't stop thinking about it. The pull is too strong - I'll be making these this weekend to everyone's delight I'm sure! I just wanted you to know that I made this. The whole thing including the GF brownie. It is all very delicious. It is a nice way to make the caramel sauce and the ginger is a nice touch. Thank you. I had a similar outcome as Eva. My caramel turned out lighter in color so I figured I did not caramelize properly but it did not become hard, just very thick. I think next time I should not be so afraid of burning my sugar. Marina: the sauce is thick - it's a reduced sauce close to dulce de leche. Don't burn your sugar or it will become really bitter but take it to a deep color. Thank you for posting this recipe. I was actually looking for a Gingerbread and Pumpkin icecream recipe to match a dessert I had at Chow's in SF but I'm happy I stumbled onto your page. The pictures are amazing and really sold me on trying this out. It took me three days to get everything made as I work until 6pm every day but it was well worth the effort and extended prep time. I started with the brownies on Sunday and made the ginger icecream base too. Then Monday night I churned the icecream in my kitchenaid standmixer and put it in the freezer. Finally Tuesday night I made the salted butter caramel sauce. The caramel sauce was fun and interesting to make and frankly much easier than I expected. However I was hoping for more crazy when I added the cream so I must not have had the temperature up high enough. Combining all three components made for a very satisfying and quickly consumed dessert. The caramel sauce sweetened the icecream bringing out the ginger flavor without being offensive. I was afraid it was going to melt my icecream but straight off the stove, the sauce went from liquid to firm on contact with the icecream. I wonder if it's possible (for me) to prepare everything in one day. What's your timing like for this recipe? Helene... just wondering about the millet in this recipe? Can I leave it out? What does it do for the finished product? I plan to make these tomorrow and have everything I need to do it except the millet! Thanks! Bethany: the millet in the recipe is another gluten free flour. So don't leave it out but replace with another one. this ice cream is fantastic. i made it two days ago and i already need to make it again. Hi, first time here, love the sound of this combination, making it for my girls night in tomorrow. While heating the cream it suddenly went rather thick!! Kept stirring and it has become a bit smoother but am a bit concerned it will not have creamy texture once churned. is that just all the finely grated ginger or has it separated? It's now cooling, reckon I should sieve it before churning. Anyone else had this? What have I done wrong? ?